Check out this new promo video for Katie Hill Photography and take a glimpse behind the scenes at two different and unique family sessions, and see Katie in action! Creating this video for her was SO much FUN! Photographers, if you're looking for an updated video to promote your brand on your website, please feel free to contact me! We are so excited to have launched a company with a place for lifestyle and documentary photographers to be inspired and have a place to grow. We will be offering classes, mentoring and portfolio reviews. For more info, check us out here at The Lifestyle Collaborative! Remember the last post about embracing imperfection? For fun, I decided to make a video too! I love this because it shares insight as to what really goes on in a scene. It allows you to take it all in and compare what you see versus what the Photographer sees. It also allows you to compare the moving elements in the video to the Photographer's final vision and still images. Showing these short clips lets viewers take it all in and it really helps to document how a moment can be captured so candidly. I also think it's important to show how with the right tools, a Photographer can make even the most mundane location seem magical. I had a great time location scouting with my friends (Kimberly Milano Photography and Katie Hill Photography) and it was fun to capture these video clips. Take a peek at this short film and from behind the scenes and let me know what you think! Let's talk about embracing imperfection. I had an a-ha moment recently while location scouting with some fellow photographer friends. Everything doesn't have to be technically perfect. And that's ok! Not so long ago, I would have placed at least half of the images in this blog post in my trash bin. I was shooting with a manual focus lens (my lensbaby twist 60) and it's HARD to nail focus of kids on the run. This is my newest toy and if you've been following my IG account, I've been crushing on the swirly background that it provides in the images. Getting back to my point about imperfection, when I downloaded my images, initially I was super disappointed. I missed focus in several of them and was immediately disheartened. Then I had a complete epiphany. 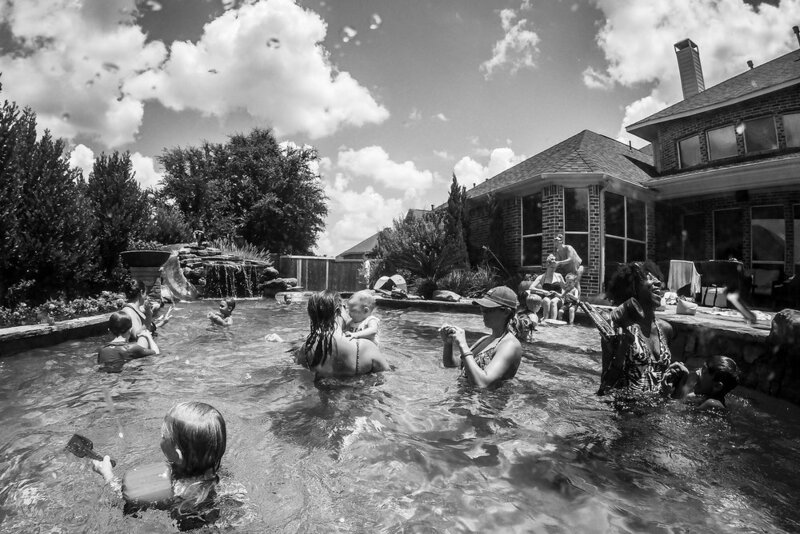 These photos show movement, and LIFE, and evoke emotion. Are they perfect? No. Do they give me all the FEELS? Absolutely! Although I was shooting for fun, I think I'm going to try and incorporate more photos like this in my regular portfolio. For Photographers | Marketing Videos Now Available! Do you want to generate more web page views and get your name out there? Consider using a short marketing video to increase organic web traffic as well as reach a broader social media audience. It's no secret that with the latest Facebook analytics, video takes precedence over regular posts. Not only do videos generate more interest; they allow you to connect and appeal to your viewers emotionally. Photographers, if you are looking for a marketing video or behind the scenes video to help increase traffic and showcase your brand, high-definition promo videos are now available! I've been accepted as a Click Pro! So it began. I put a portfolio of 150 of my favorite and technically best images together (to be harshly judged), took a deep breath, exhaled and pressed the submit button. Then I waited. And waited and waited some more. There's an approximate two week wait period and it felt like FOREVER! Until the acceptance letter came, along with sheer joy and excitement! I have access to awesome perks and have the opportunity to have my work published. It's also been amazing to see my work (such as the image below with the rainbow) featured among other Click Pros. This is such a great opportunity for me and a rewarding creative outlet. The rest of the blog post contains information verbatim from the Clickin Moms website in case any other photographers would like information on where to start. In the meantime, for those that follow my Facebook page, I've been posting on the Click Daily Project. Come take a look at my portfolio on the Click Pro Daily Project too! For anyone thinking of submitting in the near future, it's scary putting yourself out there, but the benefits outweigh the risk! 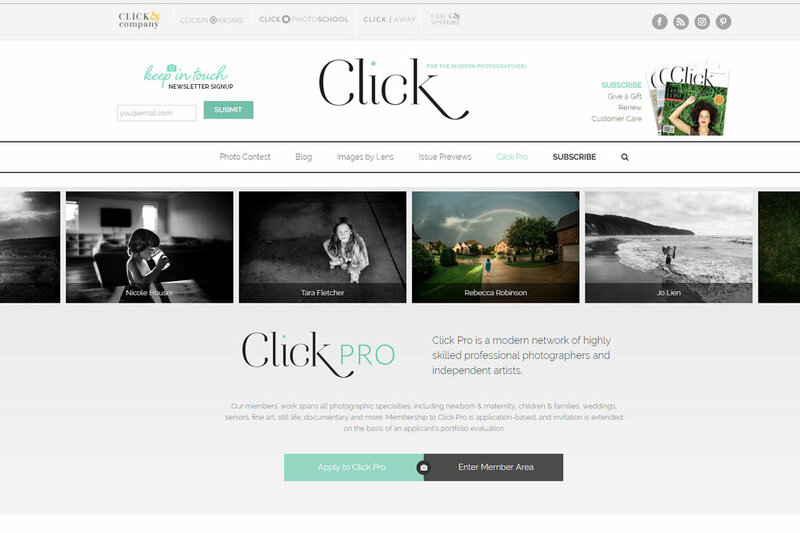 Click Pro is a women’s organization of professional photographers and highly skilled artists whose work demonstrates creativity, vision, and artistic and technical excellence. From child and family photographers to wedding photographers, senior photographers, fine art photographers, and beyond, Click Pro is a community rich in talent and diversity. Our membership benefits are designed to cater to the artistic, social, and business needs of the professional photographers and artists within our community. To be considered for membership, applicants must submit a 150 image portfolio for review. What are the benefits of being a Click Pro? 1. Click Pro Exclusives: Deals, discounts, and gifts you won’t find anywhere else. 4. Click Pro Talent Network: opportunities for a variety of features, sponsorships, and more. You can learn more about the Click Pro Benefits click here. A thorough application guide can be found, here. Applications can be submitted, here. You can join a Click Pro prep group, ask questions, or receive general review on your portfolio, here. If you're already on the Clickmoms Forum, send me a friend request! You'll see me posting around with this signature. 2017 Summer ... that's a wrap! What a great summer! I'm always excited when school starts. Not about all the chauffeuring and shuffling and schedules, but YES to routines! We've become quite lazy this summer. We stay up late, we sleep in (well, as much as a four year old will allow) and make our own schedules. For the most part, we've just flown by the seat of our pants. It was a well deserved break after a long school and sports year; but like all good things, summer must come to an end. To recap, let's see. We swam. And swam. And swam. If you missed my two blog posts with ALL of our swimming adventures, check them out here and also here. We also took a week long vacation to NC to visit family and that was awesome! About a week ago, we decided to take a last minute weekend trip with our neighbors and go explore the JW Mariott in San Antonio. The kids LOVED the waterpark (so did we) and we had tons of fun! Ready or not, school, here we come! Welcome to the world, Bennett Reade Astroth! Born on August 4, 2017, weighing in at 8 pounds, 8 ounces and 20 inches long, please join me in welcoming my nephew to the world! As a proud new Aunt, there's a little bias going on here because he is THE cutest newborn and we're all so SMITTEN with him! Press play on the video, turn the sound on and make sure to watch it in HD! It's no secret that I have been a little OBSESSED with water images this summer. 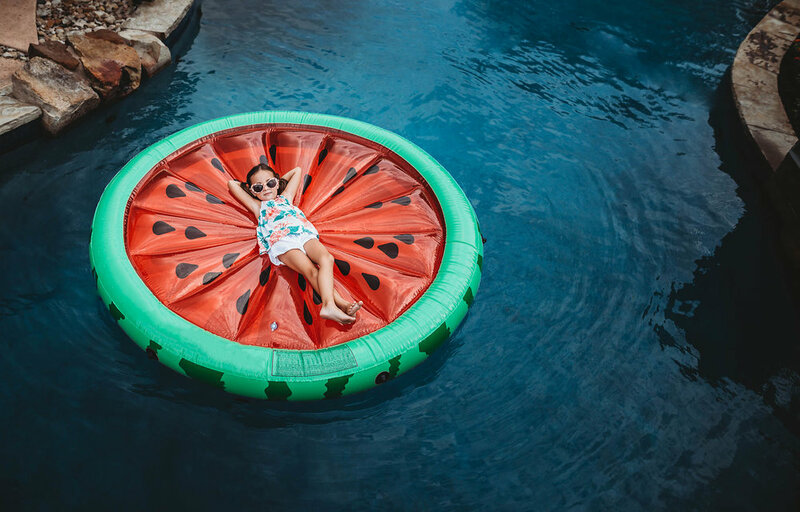 If you missed the first post with our underwater & poolside adventures, check them out here or come follow me on Instagram (there's no shortage of water fun)! Truth be told, I was planning all along on writing a second blog post with more of our swimming adventures. Honestly, I didn't think it would happen THIS quickly. I have been pushing myself creatively with editing some of the underwater images and I am super excited to share them with you. Before we get to the images, I wanted to talk a little bit about gear. Lots of people have been asking me recently about my gear, and what I use. To date, ALL of my underwater photos have been taken with my older version Go Pro Hero 4 Silver. I love this little powerhouse camera. There's a lot to be said for not using my big dslr; however, until I can get my hands on good waterproof housing, I think this camera does an amazing job.